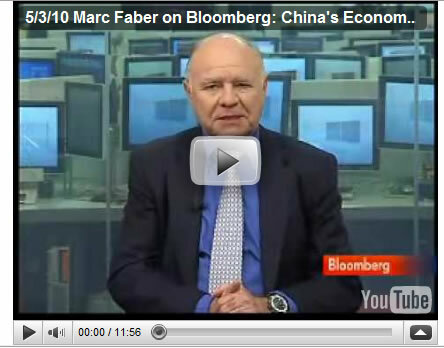 Marc Faber talks with Bloomberg's Haslinda Amin about the outlook for China's economy. Faber, speaking from Hong Kong, also discusses Greece's debt crisis and the euro, the commodities market, and the implications of political unrest in Thailand for the nation's economy and stock market. When will this doom prophet crash to his grave! 05 May 10, 23:56 Will China collapse? Will China collapse? Did the US collapsed? Would you consider a 6.1% growth in China collapsed? China's growth will be at least 10% in 2010 and at least 9% in 2011, would you consider that collapse? Almost no economist will think China can not achieve grow rates of 9-10% in the next 2-3 years. Here is why China will not crash. It is the same reason the U.S. will not crash. Everyone keeps asking, why doesn't China stop buying treasuries? How can the U.S. get away with buying their own debt through mystery direct bidders? etc etc. China is using this time to their advantage. They are spending their U.S. holdings to buy materials (metals, food, oil contracts etc). As long as the merry go round is spinning there is no need to jump off. If anything China could keep doing this as long as the U.S. keeps the charade going. They are getting ready for the moment when the U.S. can no longer sustain its debt and then they will be fine without it. Ask yourselves this for a second. Why would a country with over 1 billion people need the debt(because we don't have money anymore) of 330 million people? In my opinion I think TPTB are gearing everything to eventually come under control of the IMF with this orchestrated world crash but that's just my opinion. I don't see how the system could keep continuing to work out otherwise.